Since 2014 the world public has been thinking of West Africa with the keyword ‘Ebola’. However, the highly pathogenic agent, the Zaire Ebola virus, was discovered in 1976 in the Democratic Republic of Congo (DRC), the former Zaire, where it has since regularly led to disease outbreaks. The latest Ebola outbreak in the DRC was announced on 11 May 2017. With only eight cases, the chain of infection could be quickly interrupted and was confined to the remote ‘Likati Health Zone’ in the province of Bas-Uélé in the northeast of the DRC. The outbreak was declared over on 2 July 2017. However, where and by what route the index patient became infected with the virus remained as often unclear. To get to the bottom of these questions, a collaboration between Prof. Jean-Jacques Muyembe of the National Institute for Research in Biomedical Research (INRB) in Kinshasa (DRC) and Dr. Fabian Leendertz formed an international consortium. This multidisciplinary team of experts, whose activities are still ongoing, is made up of scientists from the INRB, the ‘Centre de Surveillance de la Biodiversité’ (CSB) at the University of Kisangani (DRC), the ‘Institut de Recherche pour le Développement’ (IRD) in Montpellier (France) and Yaoundé (Cameroun), the University of Antwerp (Belgium), the ‘National Institute of Allergy and Infectious Diseases’ (NIH / NIAID) in Montana (USA) and the project group ‘Epidemiology of highly pathogenic agents’ of the RKI. The practical coordination will be done by Prof. Steve Ahuka from the INRB. 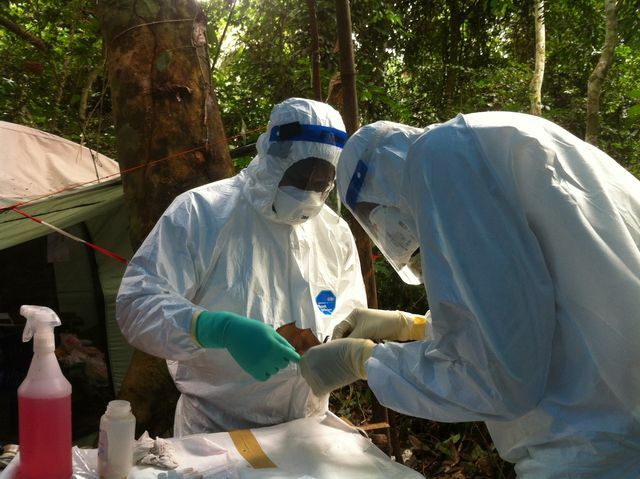 Biologist Leonce Kouadio and veterinarian Ariane Düx from the project group were part of the response team and spent a month in Kaigbono, the tiny fishing village where the index patient lived and fell ill.